The sweet aroma of strawberry spun sugar, Tahitian vanilla, and a hint of peppermint. Inspired by women who live with and overcome Cancer everyday!Barn Candles are attractively housed in our Barn Mason Jars with a black metal embossed lid. The tag is a matchbook, our trademark since the inception of the Barn Candle in 1998. The 8 ounce candle has an approximate burn time of 60 hours. The April flower is the sweet pea. Sweet peas signify blissful pleasure. Experience love at first smell with this enchanting scent of plumeria, sweet pea, muguet, and jasmine petal.Barn Candles are attractively housed in our Barn Mason Jars with a black metal embossed lid. The tag is a matchbook, our trademark since the inception of the Barn Candle in 1998. The 8 ounce candle has an approximate burn time of 60 hours. Thirst Quencher is a nice shade of light green. A refreshing and zesty lemon and lime citrusy blend with long lasting sweet vanilla and cotton candy type bottom notes -- so refreshing! !Barn Candles are attractively housed in our vintage style Barn mason jars with a black metal embossed lid. The tag is a matchbook, our trademark since the inception of the Barn Candle in 1998. The 8 ounce candle has an approximate burn time of 60 hours. Bring on Summer and a cold glass of Kool-Aid! This fragrance smells like cherry, strawberry, and orange with a touch of lemon lime thrown in for good measure. These candles are delightfully sweet and strong without being overwhelming.Barn Candles are attractively housed in our Barn Mason Jars with a black metal embossed lid. The tag is a matchbook, our trademark since the inception of the Barn Candle in 1998. The 8 ounce candle has an approximate burn time of 60 hours. 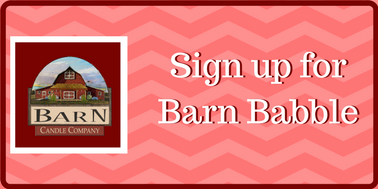 A truly delicious scent, reminiscent of baker's treats and creamy confections loaded with rich vanilla.Barn Candles are attractively housed in our Barn Mason Jars with a black metal embossed lid. The tag is a matchbook, our trademark since the inception of the Barn Candle in 1998. The 8 ounce candle has an approximate burn time of 60 hours. Ripe on the vine and vibrantly colored, this scent washes over you with the sweet smells of summer.Barn Candles are attractively housed in our Barn Mason Jars with a black metal embossed lid. The tag is a matchbook, our trademark since the inception of the Barn Candle in 1998. The 8 ounce candle has an approximate burn time of 60 hours.